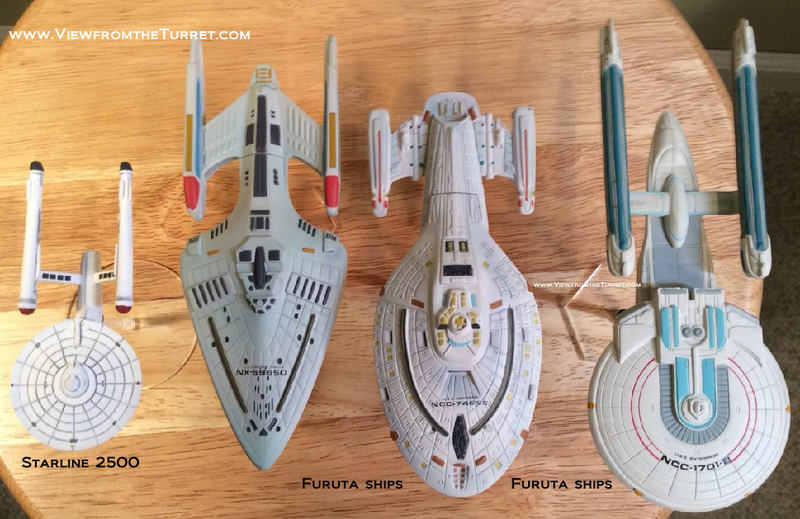 Following up on our recent look at various Star Trek ship miniatures, we stumbled upon the Furuta line of Star Trek ship miniatures. These are plastic, pre-painted display miniatures. They are sold blind but are easy to find from retailers as specific ships. First the bad news: Some of these are now essentially collectables and are extremely expensive. The good news though is many are still very reasonably priced especially considering their strengths. As you can see from the photos below the quality of the miniatures is outstanding. They are as good or better than anything out there. They come in just a few pieces and snap together — We used a bit of plastic cement on ours — in just a few minutes. The paint jobs range from very good to outstanding and also include decals. They are easily equal to or better than what many modelers will be able to do themselves and they are ready to go in literally minutes. The other good news, as you can see in the photos, is that they also scale very well with other miniatures for gaming. In the photos we put in a Starline 2500 ship miniature for comparison. The new generation Star Trek ships are supposed to be twice the size, or more, of the original ships. The problem with this from a gameplay standpoint is it just looks odd. The Furuta ships are 25% or so larger (depending on the model) than the Starline 2500 ships and that gives them a nice sense of size without being ridiculous. They mount easily on stands for gaming (we use the CorSec Engineering stands) and are perfect for Star Trek: Attack Wing or Federation Commander. The last bit of bad news is that the Furuta line basically consists of mostly Federation ships. There are a few Klingon, Jem’Hdar, Romulan and Borg ships but the choices are very limited and often now expensive. Also if we see one more large Klingon Bird of Prey we’re gonna beam ourselves into space. But there is always hope Furuta will expand the line in the future. On the plus side, because the scale works well you can use Starline 2500 and AMT Klingon models with these just fine. 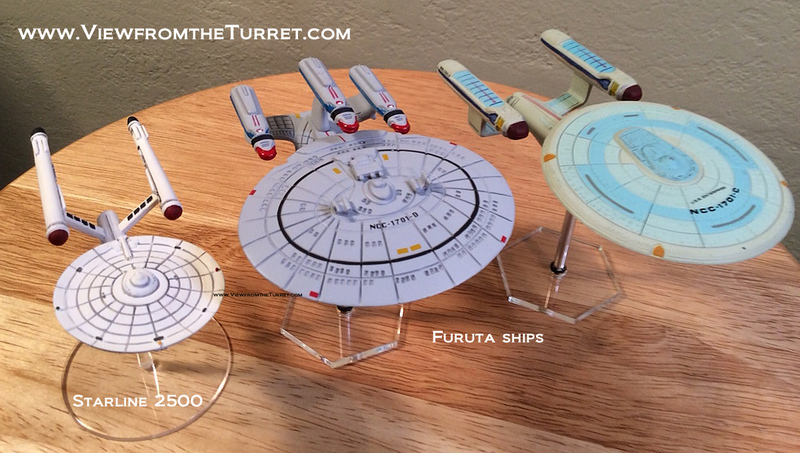 If you have any interest in Star Trek and especially if you play Attack Wing or Federation Commander you can’t get any better than the Furuta line. Top view. Enterprise-B is a good size but Voyager is a tad large. The Enterprise-C is a tad large and the Galaxy and Nebula are a tad small. Starline 2500 on left. These all work very well together for gaming. 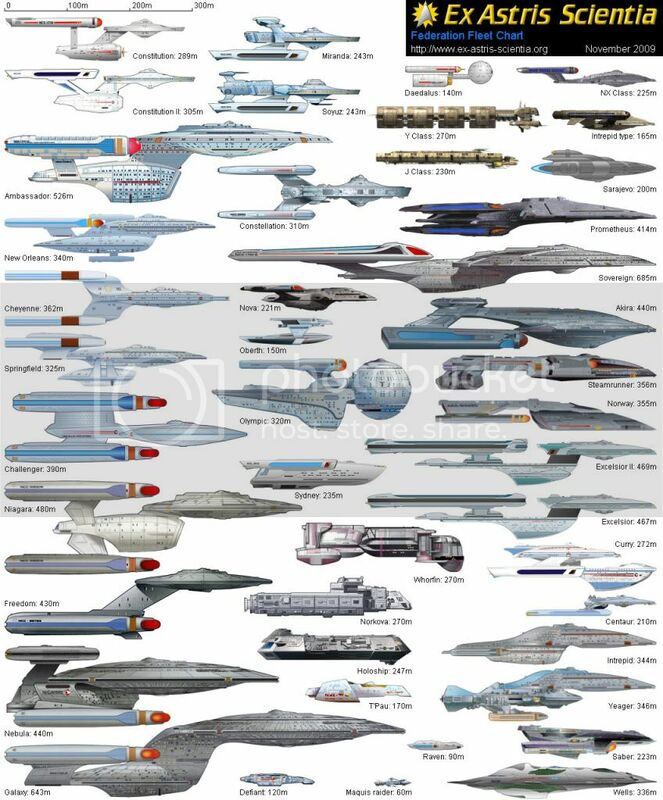 Note: Here is a nice guide to actual Star Trek ship sizes. As you can see for gaming, keeping miniatures true to scale would get strange especially as you mix in the alien races that have some truly huge ships. This entry was posted in Federation Commander, Miniature Wargames, Sci-Fi, Star Trek. With the new Star Trek: Attack Wing game out we thought it might be useful to look at a few models of the Enterprise to get an idea of their relative sizes. As you can see from the photos the new ST:AW mini is by far the smallest at 1.5″ in length. The other ships in the ST:AW line are so far around 3″ in length. So if you simply want a larger Enterprise then swapping it out with one of these options is a simple affair and it will fit in well with the other ships. The Starline 2500 line is now mostly metal and far better than the original resin releases. The AMT models are excellent but if you want to use the Enterprise-B or -D they start to get big at around 10″ long. The AMT Klingon ships are roughly the same size as the Starline 2500 Klingon ships. But if you are playing smaller games with just a few ships per side these sizes work quite well and give you the feeling of commanding large ships. Star Trek: Attack Wing Enterprise with base. Starline with AMT 1/2500 models. Also see our look at Star Trek: Fleet Captains. This entry was posted in Miniature Wargames, Sci-Fi, Star Trek. We picked up WizK!ds’ latest Star Trek: Attack Wing and a couple booster packs and thought we’d relay our impressions. WizKds licensed the same FlightPath game engine used by FFG’s X-Wing game. As a result, the rules are essentially identical but with different terms. This is of course good and bad. If you like X-Wing you will probably like ST:AW. If you didn’t you won’t. Whether or not the similarity is a turn off or not is certainly just a personal preference. The game does have its differences from X-Wing. Each ship has a captain and add-ons such as weapons and crew. These are themed to Star Trek and give a unique flavor to the game. Those combined with the different ship models do give a bit of a different feel from X-Wing. But where we think Wizkids missed an opportunity is in not making the game feel more different. One easy example would be slowing movement down a tad and utilizing more fire arcs. Currently, the game essentially has the same feel as X-Wing with respect to maneuver and fire. Most weapons fire forward and a few special ones fire all around or aft. To us it seems like some sort of power usage mechanic could have been added to give players the choice of reinforcing shields, powering weapons or increasing speed but this was not really done. Huge starships should not feel like fighters, right? Of course the problem with this opinion is that in the movies and even many of the TV episodes the ships are often shown flying around like fighters. So whether Star Trek ships should properly feel like fighters or naval ships is up for debate. A few TV and movie moments feed the naval ship impression but it probably really comes more from follow on games like Star Fleet Battles and of course just the size and general operation of the vessels in general. But if you fall into the naval ship camp the game will perhaps disappoint a little. Ok, how about the miniatures? Well, again, comparing with X-Wing is hard to avoid. Both games utilize the same flying stands. The miniatures themselves are also roughly the same size but the scale is far different. The original Star Trek Enterprise is roughly 289m long and the A-Wing is around 12m long. In game scales both are about the same size. Of course Star Trek ships vary widely in size unlike Star Wars fighters. The Enterprise-D is three times the length of the original Enterprise and the new alternate Enterprise is supposedly even larger than that. Worse the Romulan D’deridex class ship is twice the size of the Enterprise-D. This large variance in size shows up in the game but perhaps not in the best way. Whereas X-Wing has the standard fighter size along with the somewhat larger ships and the new, probably ponderous, huge ships, Star Trek: Attack Wing instead has an almost ridiculously tiny 1.5″ Enterprise (smaller than an A-Wing) and a 3″ Enterprise-D. Of course this scale (somewhere around 1/3000 or so) does allow them to do the even larger ships, such as the Sovereign-class, without really even getting to the size of a Millennium Falcon but for some reason they chose to make the Romulan D’deridex a little smaller than the Enterprise-D. So if they mean to take advantage of the scale they seem to have already missed the opportunity. 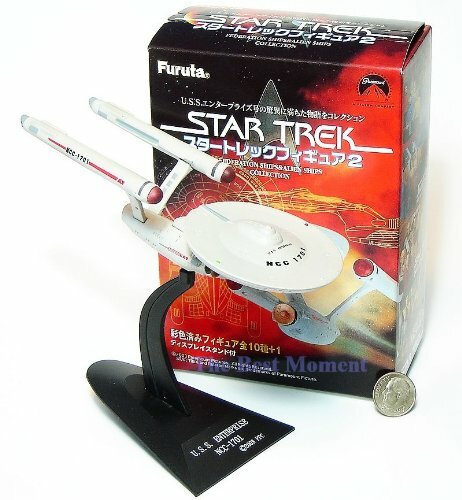 In addition, to choose a scale that puts one of the most iconic ships at 1.5″ in size seems perhaps unwise. The situation also does not help convey the feeling of fighting battles with large warships either. Perhaps the real tragedy is that one can not help but wonder what might have been if they had done the original Enterprise at 3″ and the larger ships similar in size to X-Wing’s Millennium Falcon. The price point would have been higher but I suspect fans would have been happier. Moreover, players are likely to field smaller fleets than in X-Wing so larger models, and a bit more game detail, would probably be a better choice. Size aside, the miniatures themselves also suffer a bit in quality compared to the X-Wing miniatures. Physical quality does seem to be at least as good but the paint jobs exhibit no weathering at all, which then gives them more of a toy like appearance. But for those willing to do a little paint work themselves they could look very nice. But we do think they look better in person than they appear in photos and videos so that’s a plus. Even better, some of the models indeed are quite nice such as the Klingon Gr’oth. Additionally, Star Trek fans have a number of good miniature options that could be used to replace the official miniatures if one wanted larger miniatures. There is the Starline 2500 line for original era and the AMT models for the classic and newer generation of ships. Both of those lines scale together somewhat closely depending on the model. Of course with the AMT 1/2500 scale ships the Enterprise-D is around 10″ long, which may not be ideal to say the least. There are also Hero Clix ST:Tactics models that are identical to the Attack Wing miniatures but pre-painted and based on the Clix bases. So no help with scale there. If you are a Star Trek fan you might want to give the game a look. The Dice Tower has a nice review of the game with which we agree. If you are a huge X-Wing fan and want something a little different but that you already basically know how to play it could be worth a shot as well. It is really not a bad effort it just seems to fall a bit short of where it could have been and suffers a bit from direct comparison to X-Wing. But use some different models and add a few house rules and it could be a quick fun Star Trek game that is a lot lighter and faster playing than most out there. Also see our look at Star Trek: Fleet Captains. and look at Star Trek ship miniatures. This entry was posted in First Looks, Miniature Wargames, News and Updates, Sci-Fi, Star Trek.